I think I’m in love. Harley Quinn meets Tank Girl in League of Legends latest champion, and it’s as gloriously fun as it sounds. This pale-skinned, pigtailed AD Carry isn’t really interested in romance, though. She’s more into shooting people with all manner of violent weapons. If you want to see exactly how Jinx creates her customary chaos, look at her official profile or watch the amazingly high-quality music video Riot made for her. The TLDR version: she’s a crazy chick with playful explosives, no morals, and plenty of ways to shoot you dead. All the best AD Carries in the game share a single passion: they love to shoot things (well, except for Draven, but that guy does whatever he wants). Most come in one of two flavors, though: those that can escape trouble and kite, and those that trade in that mobility for more ways to dish out damage. Jinx is the latter. The game as a whole has trended towards throwing more and more mobility options onto champions in every lane (a problem the devs lament as “mobility creep”). So it’s nice to see a totally viable AD Carry that isn’t hopping like a bunny between shots. Jinx has only marginal mobility powers—her passive ability gives a small, short movement speed boost when she helps kill a champion or turret. But what Jinx gets in exchange for blasting mobility into oblivion is impressive: a total of four guns, two of which she can use for her auto-attacks, alternating them out with her Q ability, Switcheroo. Between all of those boomsticks, and her trusty mechanical ankle-biter landmines, she has a lot at her disposal. She has AoE damage (sustained and burst), long-range poke, a massive attack speed boost, a slow, an AoE snare, stealth reveal, and a global ability. The coolest trick up her sleeve is being able to swap auto-attack weapons. Her chaingun (playfully named Pow-Pow) stacks a short-duration attack-speed buff that stacks up to three times, and her much-loved shark bazooka increases her range and damage and lets her deal wide AoE damage with her auto-attacks, at the cost of some mana per hit. Swapping between the weapons costs no mana and has a very short delay, which is important because it lets you play around with the strategy. Combat is a constant test of figuring out which weapon is best during each second of a fight. Riot’s tried to add small minigames into their new champions, and this one’s brilliantly fun to toy with. Nothing’s more fun than guns and explosives! Tell your kids! You can’t be everywhere at once and, at some point, some jerk’s going to start a fight too far away from you to let Jinx’s minigun do her thing. That’s where her ultimate comes in. 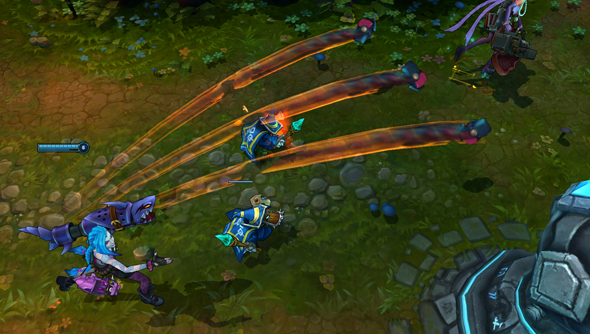 Jinx’s Super Mega Death Rocket is basically Zigg’s ultimate strapped onto Ashe’s ultimate. It won’t stun anyone, but the rocket zooms across the map and will deal hefty AoE damage to everyone anywhere close to the champion it hits. The detection range on the projectile is a bit silly at the moment. It’ll detonate if it gets anywhere close to you, even if it’s not making a visible collision. The damage is strong, and the fact that it scales with the percentage of missing health on the enemy makes it an amazing finisher. Many a fleeing fighter has been unwillingly exploded since I unlocked this champion on the test server. Some of my favorite moments with Jinx came from this ultimate. I’d make a quick calculation (thanks, high-school Geometry! ), say a prayer, and launch my rocket into the dark. A few seconds later, I’m rewarded with a satisfying BOOM! and a celebratory movement speed boost as their body disintegrates. Her Zap! ability is equally fun to play the predict-their-movement game with. It has a surprisingly long range and damage output, hitting only a bit softer than a Nidalee spear (and traveling just as far). It’s great for exploring brush, popping out a stealth champion, or chasing down fleeing enemies, since anyone it hits gets slowed and revealed for a few seconds. Even without the fancy effects, the damage alone makes it amazing help when trying to win a poke duel. All of these fun abilities mean there’s never a dull moment in lane. She does well there while having a blast—her push potential is strong thanks to her attack speed buff and AoE auto-attacks. And her Flame Chompers help her defend a turret position reasonably well, especially if the enemy gets antsy and dives in a bit too close. Unless they meant to because they realized Jinx is super fragile up close. In which case, I’m toast. It’s okay, she still loves you, Brand. That up-close vulnerability does a lot to keep Jinx’s power in check. Even in my most fed games, assassins like Zed could take me out at will. The best I could do is throw down Flame Chompers (which take 1.5 seconds to activate) and hope they helped my teammates kill him afterwards. Her potential damage output at max level and full build, however, is as insane as she is. At max rank, chain gun attacks give her a 130% attack speed boost. That’s more than four Recurve bows, and it really gets out of control once you start dancing between weapons so that you’re shooting AoE-damaging rockets at that speed. I’m not sure how much the lack of escape will limit her at high-level play, but in my personal experience (low Silver), teams weren’t often coordinated enough to really exploit it. I was often free to shoot and run, wreaking havoc along the back lines. And even if they did exploit it, I’m not sure it’d really disrup my enjoyment of Jinx. I had as many tough trudges as I had victory rushes. Her long-range ultimate and auto-attack weapon swapping are so much fun that I was still smiling when I got nuked by an assassin. I made my wife watch replays of my lucky ultimate shots twice—it’s the sort of maneuver that makes you feel like a genius when you pull it off. You have to buy her. I’m not completely convinced of her power level yet, but her fun level is absolutely OP. Just like Jinx, you’ll laugh while you blast the world around you to bits. 1. Don’t forget your rockets: When you’re chasing, swap to rockets and get 1-2 extra shots on a faster opponent before they disappear. 2. Don’t rely on those Chompers: The range is so short and the activation time so long that they won’t save you. 3. Take a lucky guess: Fire your ultimate every time there’s a chance it could get a kill. The cooldown is short, and landing a lucky shot from across the entire map feels incredible! Josh Augustine is a connoisseur of online games in the MMO, MOBA, and RPG style. He currently works as a game designer at Sony Online Entertainment on EverQuest. He’d love to talk with you on Twitter.